Thank you to those of you who already have donated to our GoFundMe campaign. So far, with online donations and checks that have been sent to our office, we have raised more than $26,335 of our $50,000 goal. Any level of donation helps get us to our goal! Jan: "I belong to three book clubs. I use this as a resource for potential book club monthly selections. Thanks for this valuable newsletter. I am excited about podcasts as a future possibility." Elaine: "I donated because I find both the info about new books and the Reading Group Guides so helpful with my reading and hosting my Book Club." 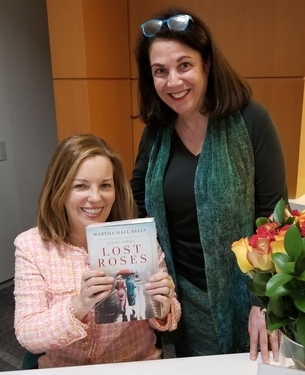 Carol attended "A Special Evening with Martha Hall Kelly" at the Random House offices and had a chance to catch up with Martha, whose new novel, LOST ROSES, is now in stores. 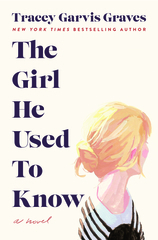 and her upcoming novel, THE CHELSEA GIRLS, which releases on July 30th. April's pick for S&S's Book Club Favorites program. time that you want to meet, and the time zone you are in; the latter is super helpful. As much information as you can share will ensure that you are all on the same page (pun intended) for your discussion. By the way, many times authors have told us that they learn something about their work by talking to readers, so this can be a win-win conversation. Susan also wrote that she had seen Tayari Jones speak about AN AMERICAN MARRIAGE in Chapel Hill, and she loved that experience. She shared, “Tayari possessed a sharp wit and really told a story to her audience that engaged all. It was excellent and a speaker I highly recommend if you have the opportunity to see her.” I have met Tayari and heard her speak, and I do agree. Beth wrote, "Last month, my book group at the Romeo District Library read THE MARSH KING'S DAUGHTER by Karen Dionne. Coincidentally, Dionne lives just a couple miles from us. So when I saw the librarian who heads our group early in the day we were to meet, I remarked that I wish I had thought to ask Dionne to come to our meeting. The librarian said that, no, she would charge for that. Our meeting was to be at 5:45 that evening. Two hours before then, I thought, what the heck, and emailed Dionne. I told her my book group is reading THE MARSH KING'S DAUGHTER and said, 'If you're just sitting around this evening, why don't you stop by our meeting?' And she did. She sat with us and talked for an hour (no charge). Isn't that a nice story? 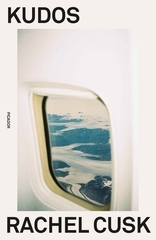 And it's a good book." We know that many of you are not in places where authors travel to regularly, so chatting with your book group via Skype or speakerphone is a great way to have an author/reader experience! You also can seek out local authors whose books you have enjoyed. Last night, I had the pleasure of attending Martha Hall Kelly’s launch event for LOST ROSES at the Random House headquarters. A photo that she found when she was doing her research for LILAC GIRLS led her to this story. She spoke about traveling to Russia for research and the “need” for a repeat trip to Paris to be sure that section of the book was perfect. She was interviewed by Christina Baker Kline, who talked to her about plumbing research and then turning it into prose. There are times when you just need to write the book and synthesize the facts into it. And let me have a fashion moment here: I loved Martha's pink suit! You can see all of Martha’s upcoming events and appearances here. One notable event is an author talk and signing she will be doing at the Bellamy-Ferriday House & Garden in Bethlehem, CT, which is Eliza Ferriday’s former home, on Saturday, June 22nd at noon. I have heard this is a stunning setting, and I think it would be enormous fun to spend the day there with your book group. You can see more info about it and buy tickets here. 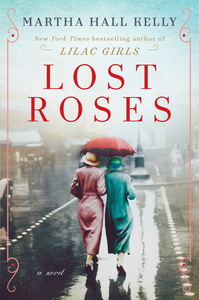 LOST ROSES is one of this month’s featured guides and an upcoming Bookreporter.com Bets On pick. Click here for the guide and here for an interview we did with Martha. Also, don’t miss our review in the April 12th Bookreporter.com Weekly Update newsletter, and my Bets On commentary in the April 19th edition of that newsletter. Edition of the novel, in addition to hosting a free Book Club Night to discuss it, in stores across the country on Tuesday, May 7th at 7pm local time. Click here to sign up for the event. 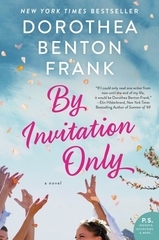 Lisa is going to be talking to Melanie’s book club in late April, and she will be talking to my recently formed neighborhood book group in early May. 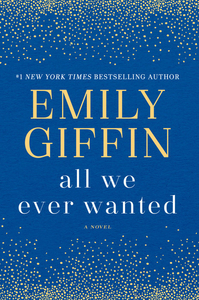 Our latest “What’s Your Book Group Reading This Month?” contest title is ALL WE EVER WANTED by Emily Giffin, which releases in paperback on April 23rd. Here’s a brief summary: Nina Browning is living the good life after marrying into Nashville’s elite. Yet sometimes the middle-class small-town girl in Nina wonders if she has strayed from the person she once was. Tom Volpe is a single dad working multiple jobs while struggling to raise his headstrong daughter, Lyla. His road has been lonely, long and hard, but he finally starts to relax after Lyla earns a scholarship to Windsor Academy, Nashville’s most prestigious private school. Then one photograph, snapped in a drunken moment at a party, changes everything. At the heart of the lies and scandal, Tom, Nina and Lyla are forced together --- all questioning their closest relationships, asking themselves who they really are, and searching for the courage to live a life of true meaning. We’re giving three groups the chance to win 12 copies of the book; to enter, please fill out the form on this page by Wednesday, May 8th at noon ET. Be sure to check out the discussion guide here and our review on Bookreporter.com here. I read ALL WE EVER WANTED last year and thought it was so well done. I felt that Emily took a giant leap in her writing here, tackling a tough subject and looking at it from many angles. 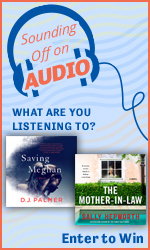 In our previous “What’s Your Book Group Reading This Month?” contest, here are the five books mentioned most frequently as titles that our book groups read: WHERE THE CRAWDADS SING by Delia Owens, EDUCATED: A Memoir by Tara Westover, THE GREAT ALONE by Kristin Hannah, THE ALICE NETWORK by Kate Quinn, and BECOMING by Michelle Obama. Scroll further down the newsletter to see the Top 15. 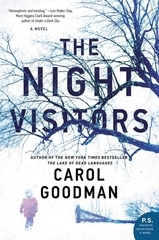 Other new guides we’re featuring this month include Lisa Scottoline's latest domestic thriller, SOMEONE KNOWS, a deeply emotional examination of family, marriage and the true nature of justice; Carol Goodman’s psychological thriller, THE NIGHT VISITORS, a gripping story of mistaken identities and missed chances, forgiveness and vengeance; and BEYOND THE POINT, Claire Gibson’s debut novel about three women who are brought together at the U.S. Military Academy at West Point. Claire Gibson was one of the authors who participated in last Monday night’s Book Club Girls' Night Out event, which also featured Taya Kyle, author of AMERICAN SPIRIT: Profiles in Resilience, Courage, and Faith. Although I was not able to attend, I am very happy that Annmarie Puleio, one of our longtime readers, was there and filed a terrific report for us that you can read here. And we have some great photos that were done by Kate Hudkins from William Morrow. Also, I am excited to share that I am going to be moderating the next "Night Out" event on June 19th, where the author guests will be Joshilyn Jackson (NEVER HAVE I EVER) and Meg Mitchell Moore (THE ISLANDERS). You can buy tickets here. We also have blogs from two of our other readers. Suzanne Leopold reports on the Virginia Festival of the Book, and Linda Johnson talks about Booktopia, which takes place each year at Northshire Bookstore in Manchester, VT and will be coming up on May 3rd and 4th. We love when our readers are our reporters; thank you to Suzanne, Linda and Annmarie. If any of you are attending events that you would like to report on, please let us know. 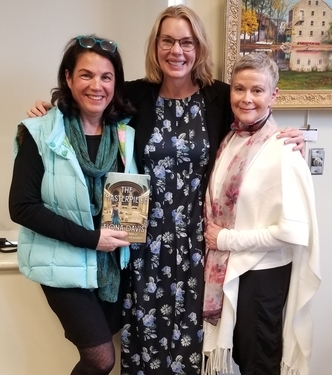 A couple of weeks ago, I had such fun at the Bernardsville Public Library where Fiona Davis was interviewed by Julie Maloney as part of Julie's "Women Reading Aloud" series; Julie also is the author of A MATTER OF CHANCE, which was published last year. This intimate interview was done in a fun, breezy style where Fiona talked about her career path --- from being an actor to becoming a journalist and then a novelist. Their lively conversation went on for an hour and touched upon all of her work, including her upcoming novel, THE CHELSEA GIRLS (on sale July 30th). It is SO well done, right down to the ending. There is a terrific twist in it that I dare readers to see coming. The story, which delves into the impact of the McCarthy hearings on the theater world, was so well told, and it will make people think critically about that dark time and what it meant for culture. To me, I think of all the great talent that was squandered during that time…and what could have been in the arts that was sequestered. If those people had not been blacklisted, what other theater history may we have had? And yes, this will be my fourth Bets On selection from Fiona. And it was nice to see some of our readers in the audience! For our latest poll, we’ve listed 13 notable books that have recently released (among them are the aforementioned LOST ROSES, SOMEONE KNOWS and ALL WE EVER WANTED), and we’re asking you which ones, if any, you have read or are planning to read with your group. Click here to cast your votes. In our previous poll, we wanted to know how often you use Goodreads to help make decisions on what to read with your group. Here are the results: A few times a month (37%), Less than once a month (22%), A few times a week (16%), Every day (6%). Additionally, 10% of you aren’t interested in Goodreads, while 8% don’t use Goodreads but would be interested in doing so. The aforementioned Beth also made a comment on this poll. She said that the option "I am not interested in Goodreads" should be reworded to "We do not use Goodreads to make decisions for our book group." She wrote, "I am interested in Goodreads and use it all the time. But my book group doesn't." We love reader feedback like this! 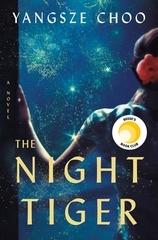 THE NIGHT TIGER by Yangsze Choo is April’s Reese Witherspoon x Hello Sunshine Book Club Pick. 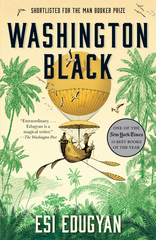 Here’s what Reese has to say about this instant New York Times bestseller: “Set in a tiny Malaysian town in the 1930s, the story is about a mystifying tiger who haunts the villages, followed by a series of mysterious deaths. 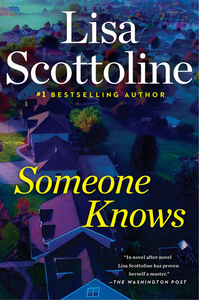 The two main characters will captivate you as their paths are destined to cross.” Check out our rave review on Bookreporter.com here. 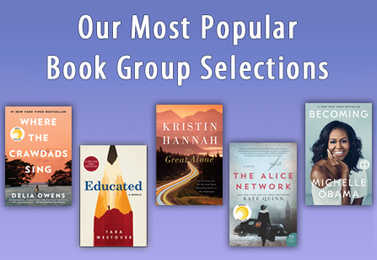 As we announced in the late March newsletter, THE FAVORITE SISTER by Jessica Knoll is this month’s pick for Simon & Schuster’s Book Club Favorites program. S&S will host a Facebook Live Book Club chat about the book on Wednesday, April 24th at 5pm ET. We encourage you to join the conversation with your comments about the book and interact with your fellow readers. 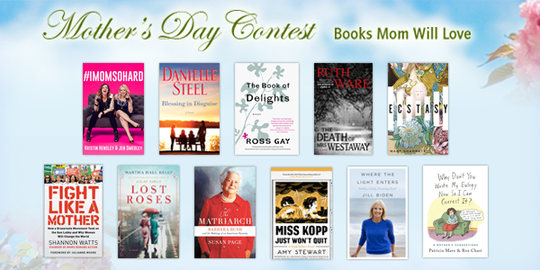 S&S is also hosting a sweepstakes where one winner will be awarded 12 copies of THE FAVORITE SISTER for their book group. Be sure to enter by 11:59pm ET on Tuesday, April 30th. Click here for all the details. Voting for the One Book, One New York program --- the nation’s largest book club --- has begun and will continue throughout the month. For the first time ever, the five books chosen as the finalists are all written by women: ANOTHER BROOKLYN by Jacqueline Woodson, FREE FOOD FOR MILLIONAIRES by Min Jin Lee, JUST KIDS by Patti Smith, NILDA by Nicholasa Mohr, and A PLACE FOR US by Fatima Farheen Mirza. Click here to cast your vote and to find out more about this worthwhile initiative, which is now in its third year. The Long Hill Book Group that I belong to is reading THE HUNTRESS by Kate Quinn for our April discussion. I have heard Kate speak a number of times, and I am looking forward to reading this book. Confession: Many times what is discussed with my book groups I already have read. This time I have “homework,” as well as the rest of the group! A reminder that our Speed Dating Event at this year's Book Expo will take place on Friday, May 31st from 1pm to 2:50pm at the Javits Center in New York. If you'd like to attend, advance signup is required by Monday, May 20th at noon ET; click here to fill out the form. Read on for more details later in this newsletter. My next live event will be on April 30th at 7pm when I return to the Fairfield Public Library in Fairfield, CT for “What Should We Read Next? An Event for Book Groups and Other Passionate Readers.” I would love to see our readers there; you can register to attend here. Here’s to a great discussion with your book group. We will be back with our next newsletter the week of April 22nd. 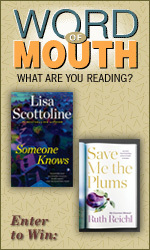 - Visit the Barnes & Noble Book Club page and sign up for their free Book Club Night. and Carol's Bets On commentary in the April 19th edition. Our latest prize book is ALL WE EVER WANTED by Emily Giffin, which releases in paperback on April 23rd. 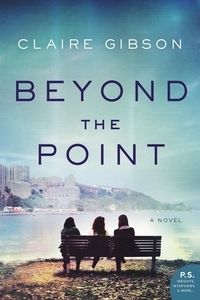 In this riveting novel from the #1 New York Times bestselling author, three very different people must choose between their families and their most deeply held values. To enter, please fill out the form on this page by Wednesday, May 8th at noon ET. Below is a preview of our "Favorite Monthly Lists & Picks" feature for April, which we've expanded this year to include many more prominent picks. For the complete Indie Next and LibraryReads lists, as well as additional links pertaining to this month's selections, please click here. Click here to see all the books that our groups recently read. 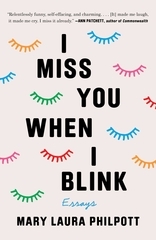 "Great Book Group Titles for Fall/Winter 2019"
On Friday, May 31st from 1:00pm to 2:50pm at Book Expo in New York, ReadingGroupGuides.com will host its 8th Annual Book Group Speed Dating Event. Representatives from more than a dozen publishers will be in attendance to share selections and book group news from their publishing houses in a speed-dating format designed to give booksellers, librarians and book group leaders an inside look at what book groups will want to know for fall and winter. Galley giveaways and ideas for enhancing book group discussions will be part of this event. Advance signup is required by Monday, May 20th at noon ET. Seating will be assigned. Fill out this form to sign up. Once you do so, you will see a note that you have registered. Please note: To attend this event, you must be registered to attend Book Expo on May 31st and have a badge. If you are not, click here to register. April’s roundup of New in Paperback fiction titles on Bookreporter.com includes Lee Child's PAST TENSE, in which family secrets come back to haunt Jack Reacher; Dorothea Benton Frank's BY INVITATION ONLY, a tale of two families, one struggling to do well, one well to do, and one young couple --- the privileged daughter of Chicago’s crème de la crème and the son of hard-working Southern peach farmers; Man Booker Prize finalist WASHINGTON BLACK by Esi Edugyan, a dazzling adventure story about a boy who rises from the ashes of slavery to become a free man of the world; THE DEATH OF MRS. WESTAWAY, Ruth Ware’s fourth novel in which a tarot card reader mistakenly receives a mysterious letter bequeathing her a substantial inheritance; and A NOISE DOWNSTAIRS, a haunting psychological thriller from Linwood Barclay about a man who is troubled by odd sounds for which there is no rational explanation. 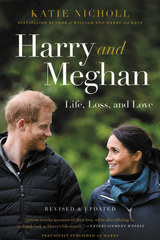 Among our nonfiction highlights are LOOK ALIVE OUT THERE, a brand-new collection of essays filled with Sloane Crosley's trademark hilarity, wit and charm; HARRY AND MEGHAN, royal expert Katie Nicholl's intimate and informative portrait of Prince Harry, his marriage to Meghan Markle, and how their union is modernizing the Royal Family; EUNICE, in which Pulitzer Prize-winning journalist Eileen McNamara examines the life and times of Eunice Kennedy Shriver, arguing that she left behind the Kennedy family’s most profound political legacy; Kelly Corrigan's TELL ME MORE, a story-driven collection of essays on the 12 powerful phrases we use to sustain our relationships; and PATRIOT NUMBER ONE by Lauren Hilgers, the deeply reported story of one indelible family transplanted from rural China to New York City, forging a life between two worlds. April 1st, April 8th, April 15th, April 22nd and April 29th. - Click here to read more about the audiobook. Click here to read more of Carol's commentary. Tell us about the books you’ve finished reading with your comments and a rating of 1 to 5 stars. 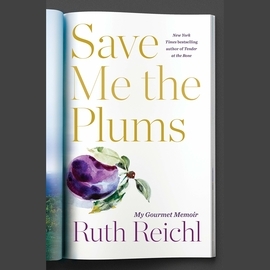 During the contest period from March 29th to April 12th at noon ET, three lucky readers each will be randomly chosen to win a copy of SOMEONE KNOWS by Lisa Scottoline and SAVE ME THE PLUMS: My Gourmet Memoir by Ruth Reichl. on Friday, April 12th at noon ET. or Are You Planning to Read, with Your Group? Click here to vote in the poll by Wednesday, May 8th at noon ET.